The Blizzard Authenticator offers an additional layer of security against unauthorized account access on up to three Blizzard accounts. You can purchase a physical authenticator, or use our free smartphone app. Note: You can only attach the physical authenticator to a single account. When using the Blizzard Mobile Authenticator, we recommend using SMS Protect. This free service allows you to easily remove an authenticator using text message verification. When you log in to your account, an authentication request is sent to your device. If the code on your device matches the one on your computer, press Approve. If you want to login using the authenticator’s randomly-generated numeric code instead, click Use Authenticator Security Code on your computer. Then press Enter code manually on your device to generate an authentication code. Each code is unique and valid only once. If you prefer to enter a code at every login, visit the authenticator page in Blizzard Account Management, and check Require an authenticator code every time you log in to the game. If you login consistently from the same location, you may not be asked for an authenticator code. This makes login faster when you're at a secure location. If you receive an authenticator request that you did not initiate, click Deny and change your Blizzard account's password. Note: Classic games are not protected by the Blizzard Authenticator. To make sure your computer is secure, review our Account and Computer Security article. If you want to move your Mobile Authenticator to a new device, you'll want to remove the old one first, then add a new one. If you don't have access to the old device, please contact us. When using a Mobile Authenticator on an Apple device, you can enable iCloud Keychain to save your authenticator's serial number and restore code to Apple's iCloud. If you change devices, you can easily restore your authenticator without having to contact customer support. If you need to remove your authenticator for any reason, follow the steps in this article. The Core Hound Pup is an account-wide pet available to World of Warcraft players on realms located in North America, Europe, and Korea. 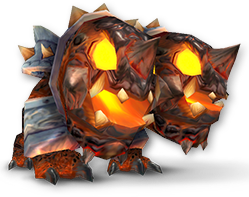 After attaching an authenticator, you'll find the Core Hound Pup waiting in your in-game mailbox. If you remove your authenticator, the pet will disappear from your collection after you log out. You'll need to reattach an authenticator to receive the pet again. When you attach both the Blizzard Authenticator and Blizzard SMS Protect to your account, your primary backpack size is increased. If you remove either the Authenticator or SMS Protect, your backpack reverts to its original size and the items in those slots are moved to free slots in another bag.